The IDA, made up mostly of citizen appointees, had gone into executive session in two of the four meetings it held so far this year prior to the May 12 meeting. It did not go into executive session on May 12. Haygood also told me on May 14 that he was resending to county committees and staff a second document he produced back in 2012 reviewing the then-new state open records and open meetings legislation. He resent that document after I filed a complaint with the office of state Attorney General Sam Olens regarding seven meetings the county had held in 2013 as it reshaped its farmland protection program. The county did not give public notice of those meetings before they were held. On May 12 Shiela Guider, a paralegal in Olens’ office, informed me that the Attorney General’s Office would not investigate my complaint on technical grounds. I had informed Haygood when I filed my complaint with the Attorney General on April 27, and I sent him a copy of the response I received from Guider after I received it on May 12. The correspondence with Guider and Haygood was via email. Two of the meetings held last year on the farmland program had been called by Board of Commissioners Chairman Melvin Davis and attended by Commissioner Mark Saxon as well as Davis. The other five meetings had been called by a committee appointed by the BOC but made up entirely of citizens. “Anytime volunteers are involved there is a chance that they may not understand all of the laws as well as the paid staff and elected officials,” Haygood wrote to me and the Attorney General staff. “All BOC appointed committees are being reminded of their obligations under the Open Records Act and Open Meetings Act, with a special caution about executive sessions,” Haygood wrote. “The County Clerk will pay particular attention to those committees which do not regularly have county staff at their meetings,” he said. Haygood copied his email to Stefan Ritter, senior assistant attorney general, to whom I had sent my complaint. When I did not hear from Ritter in response to my April 27 complaint, I sent him a second email on May 4. I called Guider, his assistant, on May 12, since I still had not received acknowledgment from Ritter of my email. Guider informed me that no action would be taken on my complaint because the meetings in question had taken place more than 90 days before I filed the complaint. I had spoken with Guider on Jan. 15 of this year about these meetings, and she encouraged me to file a complaint. She did not mention the 90-day restriction, and I missed it in my reading of the law. The 2012 revision of the state’s opening meetings and open records legislation was initiated by Olens and passed by the General Assembly. Gov. Nathan Deal signed it into law on April 17, 2012. 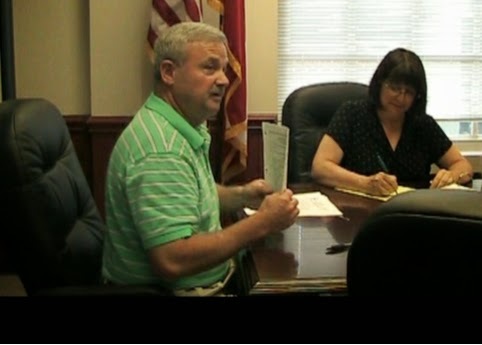 Haygood briefed the Board of Commissioners on the law at its meeting on April 24, 2012. The memo that Haygood prepared for and distributed to the staff and citizen committees explicitly states that the act covers “Any committees set up by the governing body” of the county or its departments, agencies, boards, offices, commissioners, authorities, or similar bodies. Haygood stated in the memo that meetings can be held only after public notice of time, place and date of all meetings has been given. In the memo Greathouse sent to Waller and other committee chairs on May 8, Haygood stated that any committee or authority that wants to hold an executive session, that is, a session closed to the public, can do so only after contacting BOC Chairman Davis or County Administrative Officer Jeff Benko in advance. Davis is a member of the county’s Industrial Development Authority. Haygood was not present, according to IDA minutes, when the body went into executive session on March 10 for the same stated purpose. Haygood’s memo states that executive sessions can be held only to discuss certain types of litigation, to discuss lease, purchase, sale or options of real property, and to discuss pay, hiring, firing, discipline or evaluation of an employee or public official. Once in executive session, the presiding officer is required to rule discussion on other topics out of order and adjourn to open session if the discussion continues, Haygood wrote. Either the presiding officer or all members of the group that went into executive session must file an affidavit stating why they went into executive session. Haygood provided as part of his memo to citizen boards and committees and example of an affidavit. That sample lists the Industrial Development Authority by name. So even though these are volunteer committees they are being told there's no need to meet so often since no one wants to be bothered keeping tabs on them.